Absolutely Gorgeous and Fantastically Attractive MAGIC Bracelet. 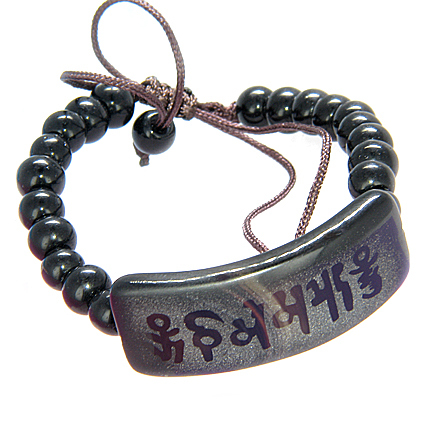 It is made from BLACK FROSTED AGATE Gemstone. It has SUPER Nice GEMSTONE Charm with Very Old Ancient Symbols. These symbols represent MAGIC and GOOD LUCK Powers. Bracelet cord has black plastic beads. It comes on VERY Popular Adjustable cord, and will fit most size wrists. Agate known as a Good Luck stone. It Brings Peace and Happiness. Agate is a Protective stone. Its protective energies are more gentle and subtle than some stones. It can be particularly effective when calling upon Angels for protection. Inspiration is another hallmark of blue lace agate and that can assist in inner attunement, and has been said to be useful for performing Miracles. As well it balances Yin-Yang energy. It can help bring stronger intuition and inner knowing. Blue lace agate is considered a stone of communication. Agates have long been thought Magical, curing everything from thirst, the evil-eye and bad dreams.